The unavoidable internet is impacting on TV, with the likes of SkyByBroadband and the forthcoming BTVision. Here's the next stage. 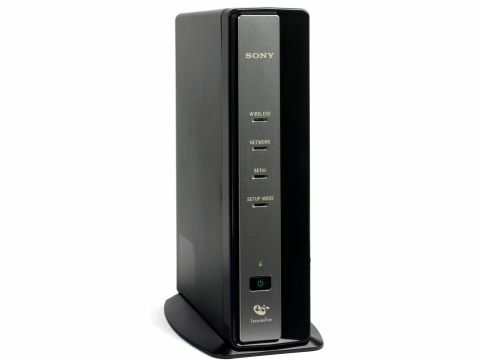 Sony's LocationFree internet video streamer (like its rival, the Slingbox) enables you to securely watch your favourite TV shows anywhere in the world - provided a sufficiently-fast (300kbps) broadband internet connection is at your disposal. The LocationFree consists of two components. The LF-PK1 'base unit' resides at home, alongside your AV gear. It is equipped with two sets of composite-video and stereo-audio inputs for connecting set-top boxes and recorders. There's also a socket for the IR blaster, an infra-red transmitter that's physically-aligned with the infra-red 'windows' of your source equipment. To connect with your broadbanded home network, you're given a choice of Wi-Fi or Ethernet. The base unit's job is to digitise the analogue video, compress it (MPEG-4 is specified) and then stream it over the network. Then there's the viewing 'client', which needs to be registered with the base unit - part of a straightforward configuration process. You can use a Sony PSP as a client, provided it's been upgraded to the latest firmware (v.2.7). As the PSP incorporates Wi-Fi, you'll be able to gain access via public 'hotspots', like certain cafes. Don't have a PSP? Sony sells a Windows XP LocationFree player (one's included in the package). As well as watching video, the clients will allow you to switch between the two AV inputs and remotely-control many varieties of source equipment. Because it simulates all of the handset's main buttons, LocationFree will let you access EPGs, view PVR content and schedule recordings. Streaming video directly from our broadband network to our PSP rewarded us with good visuals and sound. There's some artefacting, even at the highest-quality setting (there are five, plus 'auto', in total) but the results are nevertheless acceptable. The NetAV PC client yielded similar results. We then installed another copy of the LocationFree player on a broadbanded PC 40 miles away. After registering it, we were able to access the base station. Video quality wasn't quite as good here, with noticeable 'blocking', although audio was fine. The ability to remotely-schedule recordings is a real boon. We successfully managed this with our SkyHD box; in this sense, LocationFree represents a 'free' alternative to Sky's 'Remote Record'. All in all, the LocationFree is an intriguing and versatile development, especially for PSP owners.